A condition of Extreme Damp-Heat equates to a more severe progression of the Shi Lin Pattern (stone). A severe accumulation of Damp-Heat causes bladder "inflammation" and irritation. Traditional Chinese medicine refers to this as extreme bladder heat. Many pet owners will have administered antibiotics to treat this type of pattern. The benefit of Urinary Free the Flow: Damp Heat is that it functions as an alternative to more courses of antibiotics especially since antibiotic resistance is a real possibility. This is an incredibly effective formula read the success stories! According to Traditional Chinese Medicine terminology, bladder stones are called "Shi Lin", translating to "painful urination due to stone obstruction". Traditional Chinese Medicine (TCM) explains the forming of bladder stones is due to the pre-existence of pathological heat and damp. This turbid fluid called Damp-Heat may cause a pet to become vulnerable to bladder stone formation. Bladder stones are formed for a variety of reasons, however in dogs, most of the time they can be traced back to dietary taxation. There are also certain breeds that are constitutionally predisposition to this condition. Pet Owners Beware! It is very important that every pet owner understand this: Once a pet develops bladder stones they are prone to forming them for the rest of their lives, and as a sad result, many pet owners end up paying for very expensive multiple surgeries, that ultimately hurt the bladder by building layers of scar tissue, which creates a hostile bladder environment. 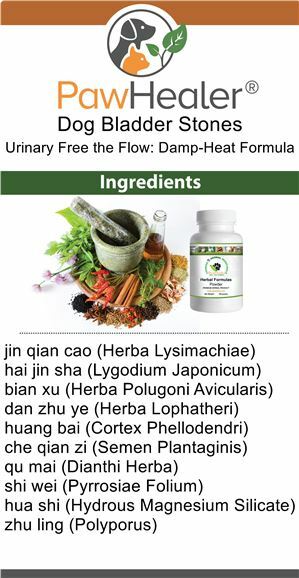 What You Can Do: To help you reestablish bladder health, we suggest that you try our Chinese herbal formula called Urinary Free the Flow: Damp-Heat We are extremely excited to we offer this product and we do so with confidence. We have helped many pet owners to actually observe the ease and comfort in which their stone-prone pooch can pass water with these effective Chinese herbals. These herbs help by naturally promoting urination and by freeing the flow of urine while supporting your pet's natural ability to dispel stones! How long should Uninary Free the Flow: Damp Heat be taken? Uninary Free the Flow for Damp Heat is to be used for the period of time in which there is that dark smelly urine. Once the urine normalizes to a normal color, you would want to transistion over to the Uninary Free the Flow : Basic. 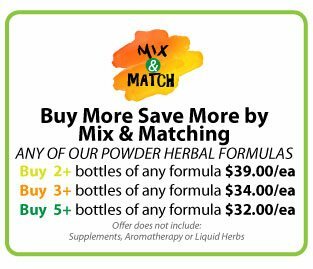 You don't want to stay on this formula for longer than necessary since they are herbs are considered bitter and cold. Any substance of a cold nature taken for long periods of time will of course damage yang. Antibiotics are an example of treating an infection with bitter and cold herbs. After awhile the digestive yang is diminished and can ultimateliy effect the Kidney yang. Paw-Zymes addresses root problem. Poor digestion in most cases is the root cause to bladder stone problems. There are lots of benefits when supplementing with digestive enzymes. This triple combo pack adds Petigreens which has a cooling effect on the digestive tract which can have an overall balancing effect on the body. 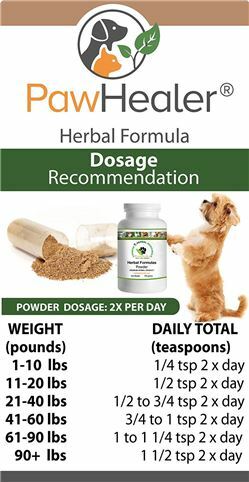 ALSO adds the benefit of the heart & kidney organs and glands found in Rena GO -- which are ideal supplements for pets for when the owners want to provide nutritional support for specific endocrine systems, and to complement the diet with the incredible array of nutrients found in organs and glands from healthy, carefully raised animals.